The Royal Opera House (Kunglinga Operan) occupies a significant location Gustav Adolfs Torg just opposite what is now the Swedish Foreign Ministry and across the bridge from the Royal Palace. An earlier opera house was built on this site by Gustav III as the mirror image of the building opposite. This house became famous as the site of Gustav III's assassination at a masked ball in 1792, an event immortalized in Verdi's opera "Un Ballo in maschera" of 1859. The present opera house was completed in 1898 and many are still unhappy that it destroyed the symmetry the earlier house created. The exterior is unremarkable, but the interior is lavishly decorated with an entirely gilt bar on the second floor. The auditorium with only 1090 seats is small compared to houses in other European capitals, but it ensures that even a grand work like "Tannhäuser" has an intimate feel. The "Tannhäuser" I saw was a new production that had premiered on April 20 this year. Director Staffan Valdemar Holm and designer Bente Lykke Møller had updated the setting of the work from the Middle Ages to Wagner's own lifetime. In fact, the costuming seemed intended to draw a parallel between Tannhäuser and the young Wagner himself as a composer and rebel against the restrictive norms of society. The most controversial aspect of the production was the staging of Act 1, Scene 1 in the Venusberg. Instead of presenting a ballet to the music Wagner wrote for the Paris version, Holm had the chorus in costumes representing all times and places chase each other in and out a series of doors hidden in a huge blow-up of Rubens's "Adoration of Venus" (after Titian). Rather than making the Venusberg seem seductive or dangerous, Holm made it look like a door-slamming French farce gone berserk. Maybe this is Holm's comment on the foolishness of the French demand that Wagner add a ballet to his opera. The scene was quite amusing but low comedy is not what Wagner had in mind. The worst part was that the constant opening and closing of doors made noise throughout the entire Venusberg music making any beauty the orchestra achieved in vain. The cleverest aspect of the design was that Venus was clad in an 18th-century costume where the central panel of her gown reproduces the same Rubens painting. This rather handily suggested that what Tannhäuser/Wagner seeks to escape is the stifling self-refexiveness of the earlier century. If the Venusberg section was distracting, the direction and design of the rest of the opera was quite refreshing. Møller's Wartburg turned out not to be a medieval castle but a huge library with book-lined walled extending up both sides of the stage with a panorama of mountains in the distance. Elisabeth and her father, the Landgrave of Thüringen, seemed to belong to a kind of pietist community where the women are clad in identical back dresses and hats and the men in identical black suits and hats. The repression this represents made immediately clear why Tannhäuser should have fled it to experience life in the Venusberg. Where the female-ruled Venusberg showed a chaotic equality between men and women, the male-ruled Wartburg sees women as inferior. When the Landgrave announced without consulting her that his niece Elisabeth will not only give the prize to the best singer but also be the prize, Elisabeth remained horrified and grim throughout the competition. In Act 3 as Elisabeth waits to see if the Pope will absolve Tannhäuser, Holm and Møller emphasized the sense of barrenness by changing the season from spring to winter and showing the library shelves empty. The only colour came at the very end when a page sprinkled the leaves that have sprouted from the pope's staff over the body of the Elisabeth. Holm elicited highly detailed acting from both the principals and the chorus so that one tended to follow the opera more as a play than a spectacle. I seem to have caught Thomas Sunnegårdh as Tannhäuser on an off night. He has a strong, dark-hued tenor, but had acquired the gruff delivery that often characterizes Wagnerian tenors and seemed short-winded throughout. He played Tannhäuser/Wagner as an angry young man, but his restless staggering about the stage to show this was the least successful acting in the production. The real star of the show was Gunnel Bohman as Elisabeth. Her radiant singing of "Dich, teure Halle" at the start of Act 2 seemed to set the opera back on course after the oddness of Act 1 and made her character rather than Tannhäuser the emotional centre of the work. She is also such a fine actress that during the long sections of the "Sängerkrieg" when she is silent, she still held our attention as we watched her every reaction to the contestants. Her spiritual opposite was the Venus of Cornelia Helfricht. Given the designer's Italianate setting, it made perfect sense that she should emphasize in tone and phrasing the Italianate aspects of Venus's music, making Venus seem, as she should, to be from an entirely different world. Her bright soprano and careful word pointing gave us a Venus who could switch from coquetry to anger and back in a moment, thus becoming the perfect foil for the steadfastness of Elisabeth. Among the other principals, Lennar Forsén's powerful bass gave the Landgrave such authority that Elisabeth's plight seemed even more hopeless. Gunnar Lundberg persuasive singing as Wolfram von Eschenbach was crucial in showing the sort of kind, earnest love Elisabeth rejects in order to save the sinner Tannhäuser. Ketil Hugaas's rich bass made more of the role of Biterolf than I've seen before. And tenor Stefan Dahlberg provided an unlooked-for sense of comedy by making Walther von der Vogelweide into a preening fop. A boy, Martin Alexsson, rather than the usual soprano, sang the role of the Shepherd. The chorus, the Kunglinga Operans Kör, sang magnificently throughout giving glowing sincerity to the well-known Pilgrims' Chorus. Conductor Alberto Hold-Garrido drew vital, committed playing from the orchestra, the Kungling Hovkappellet. For unknown reasons, perhaps Mr. Sunnegårdh's indisposition, he played all of Tannhäuser's set pieces at a faster pace than usual, so that, for example, Tannhäuser's entreaty to Venus, "Dir töne Lob!" sounded rushed. Otherwise, Hold-Garrido's taut rhythms ensured that the work never lost a sense of urgency. This is a production I would like to see again, especially to test my view of the Venusberg section. Otherwise, I will remember it best for its drama and the beautiful singing of Ms. Bohman and the chorus. 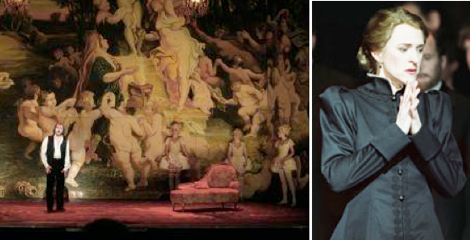 Photo: Thomas Sunnegårdh as Tannhäuser in Venusberg; Gunnel Bohman as Elisabeth. ©2002 Stig Andersson.